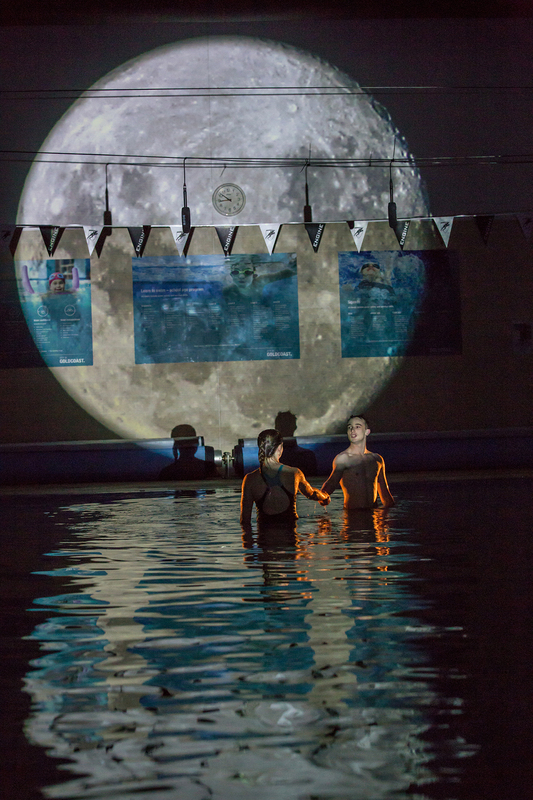 It’s an inky night at the Gold Coast Aquatic Centre where I don my earphones ready to dive into PLUNGE, a new work from Seeing Place Productions, a site-specific, audio-immersive company based at the Gold Coast and founded by Kate Shearer. The tunnel-like entrance is lit with bands of primary colour as we’re ushered in by a chorus of tracksuited and capped divers. Like land-locked synchronised swimmers, the troupe fan out in phalanxes front and back to guide us through the pristine new centre which will be hosting water sports at the Commonwealth Games in 2018. The sense of eerie intimacy generated by being in this major public site with such freedom of access is immediate. That together/alone frisson is reinforced by a lulling voice-over which weaves together a mesh of sound composition and interviews with real athletes, their coaches and parents. Then, live dialogue from the actors cuts through the soundscape as we watch from above or at floor level across large expanses of pool and cement. PLUNGE delivers its spectacle quickly and with authority, starting with an introductory sequence behind a glass wall as two male swimmers try to psych each other out. This is followed by our female protagonist, a diver, whose story plays out atop the elegant white diving tower, climaxing with the pleasure for us of watching one, two, three, four and then five divers plunge effortlessly from the heights into the silver water below. The simple and accessible narrative has all of the classic sports story tropes — the boy who could, the former great on the decline, the child prodigy diving for her parents’ dreams rather than her own. But all the narrative clichés are forgiven for the lyrical quality of the language, the visual poetry and scale of the projected animation and the deftness of our positioning in relationship to the site. My only quibble is that the female diver’s story is never resolved. 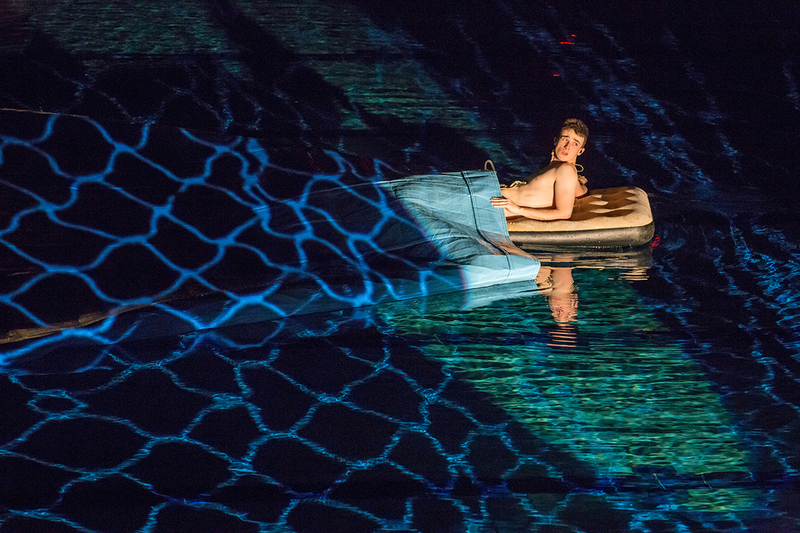 It’s mesmerising watching elegant bodies dive into moonlit pools and witnessing heartbreakingly beautiful contemporary dance performed in dark, warm, steamy wading pools. Add to the mix the arresting black and white scaled-up projections onto the water and walls and the pull under and into the stories is irresistible. PLUNGE felt like the culmination of the form that Shearer has been developing across Seeing Place’s prior siteworks like CAPSULE and ALL ABOARD! with a calibrated balance between audio, site and performers. PLUNGE included longstanding collaborators Guy Webster (sound) and Geoff Squires (lighting) with the addition of AV man-of-the-moment Nathan Sibthorpe, and showcased the choreography of local independent choreographer Alicia Harvie, the powerhouse energy of Hayden Jones (of Shock Therapy theatre company) and the talent of relative newcomer, actor Mitch Wood. Such collaboration is now characteristic of the performance work on the Gold Coast, privileging site and memory and a sophisticated popularism. Hopefully such work will take its place in the arts and cultural events to be programmed for the Commonwealth Games next year.